Our country is considered for many reasons an Europe's windsurfing Mecca. There is thousands of kilometres of coastline, all kinds of wind conditions and warm climate. Every year, lots of windsurfing lovers from all over the world come to the Spanish beaches to practise their favourite sport. Windsurfing is certainly known for its ease of transportation and mount candle mode. It is easiest way to slide over the water with the single help of wind. 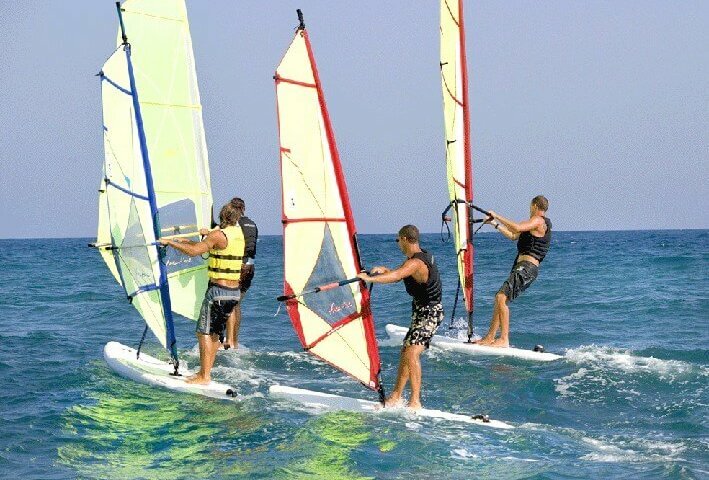 Starting to windsurf will allow you to obtain basic notions of sailing and will also improve your physical conditions, coordination and strength. Nowadays, you can go windsurfing all year round, but for sure, the best season for climates conditions is from April to November. In our PaddleinSpain centers you can have both options to beginners and advanced windsurfing courses, or if you want only rental equipment. If the surfboard is a vital part of your holiday, then make sure PaddleinSpain figures in your travel plans.